Windows 10 October 2018 Update appears to have once again run into hot water – this time, with Apple. To recall, Microsoft last week announced the resumption of the rollout of its Windows 10 October 2018 Update (aka version 1809) starting with commercial customers. The company had suspended the update after numerous bugs began being reported by end users. Now, Microsoft says Apple has identified an incompatibility with the latest version iCloud for Windows that may prevent Windows 10, version 1809 users from updating or syncing Shared Albums. Until the issue is addressed, Apple has blocked Windows 10, version 1809 users from updating their iCloud app, and Microsoft is blocking devices with the latest version of iCloud installed from receiving the Windows 10 October 2018 Update. Several other bugs were reported on Friday, including one for F5 VPN clients, and one that affects mapped drives. A few other bugs were reported earlier in the week. The support page noted that users who attempt to install iCloud for Windows (version 7.7.0.27) on Windows 10, version 1809 will see a message stating that this version of iCloud for Windows isn’t supported, and the installation will fail. Microsoft also said it is blocking devices with iCloud for Windows (version 7.7.0.27) software installed from being offered Windows 10, version 1809 until this issue has been resolved. Microsoft noted that users should not attempt to manually update their version of Windows to version 1809 using the Update Now button or the Media Creation Tool until the issue is resolved. Microsoft added that it is working with Apple to provide a compatible release of iCloud for Windows 10, version 1809 in an “upcoming release”. As for the other bugs, Microsoft on Friday reported that after updating to Windows 10 version 1809, F5 VPN clients may lose network connectivity when the VPN service is in a split tunnel configuration. A workaround was detailed – users should manually configure their systems to force all traffic through the VPN tunnel. An update with a resolution was promised in an upcoming release. Also on Friday, Microsoft said mapped drives may fail to reconnect after starting and logging onto a Windows device. Symptoms of this problem can include in File Explorer, a red “X” appears on the mapped network drives; mapped network drives show as “Unavailable” when you run the net use command from a command prompt, and in the notification area, a notification displays, “Could not reconnect all network drives.” It also detailed workaround scripts to automatically reconnect a mapped network drive when you log on to the device. A resolution to this issue can be expected in November 2018, Microsoft added. 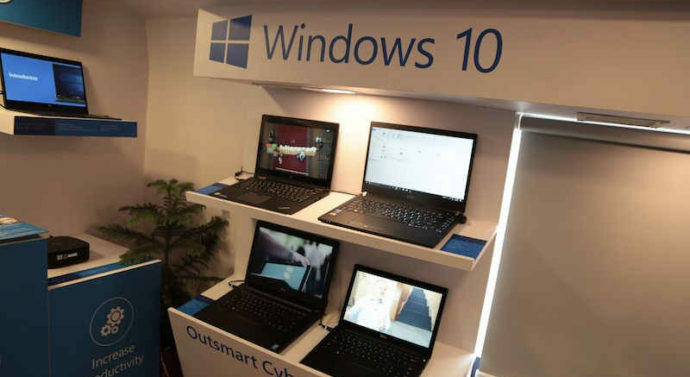 On the day of the re-release of the Windows 10 October 2018 Update, Microsoft revealed that Trend Micro has identified a compatibility issue with Trend Micro’s OfficeScan and Worry-Free Business Security software when attempting to update to Windows 10, version 1809. Microsoft is blocking devices running the affected business endpoint security products from being offered Windows 10, version 1809 update until a specific Trend Micro Critical Patch (CP) is applied. Finally, Microsoft notes that updating to Windows 10, version 1809, Microsoft Edge tabs may stop working when a device is configured with AMD Radeon HD2000 or HD4000 series video cards. Customers may get the following error code: “INVALID_POINTER_READ_c0000005_atidxx64.dll”.